Camomile (or chamomile) originates from the Greek words for "ground" and "apple," because the Camomile plant grows close to the ground and has a strong aroma that is reminiscent of apples. It is one of the most loved teas in the world and in many cultures it is regularly gathered in the wild, washed, and laid out to dry at home. Some of the best teas will contain camomile leaves, flowers, and a few stems. The tea may be sweetened with your favorite Honey or a squeeze of lemon and a cinnamon stick will add an interesting taste. It may have some therapeutic effects and is believed that camomile relieves upset stomachs and indigestion, calms and relaxes, and promotes sleep. Chamomile may also be particularly good for allergies, helping not only to relieve the immediate symptoms, but other problems caused indirectly, such as loss of appetite, stress, and aches and pains. Chamomile is one of the oldest garden herbs, whose reputation as a medicinal plant shows little signs of abatement. Considered a universal remedy by the ancient Egyptians, Chamomile continues to be used today to battle illness, promote calm and relieve anxiety at bedtime. As a tisane (herbal tea), it is naturally caffeine-free. 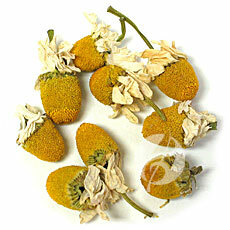 The finest varieties of Chamomile, of which our tea is great example, continue to come from Egypt. If you have yet to try it, you'll be pleasantly surprised by its superior flavor. 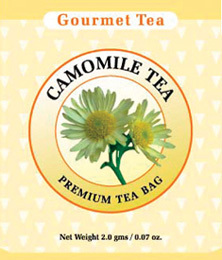 Chamomile is said to be calming without depressing and is used for treating anger.